While a high-quality dry dog food can provide your canine companion with the balanced diet they need to reach their full potential, a few healthy extras can provide some supplementary benefits. Natural fruits and vegetables are an excellent source of vitamins and minerals. They can be used as a tasty treat in lieu of the fatty packaged dog treats you see at your local pet shop. With that being said, it's important to know what your dog can and cannot eat. Your dog's body isn't capable of consuming all of the same foods that we humans do. Some foods are toxic and can lead to a host of health issues. One food that's often a point of contention among dog owners is dates. Dates are an edible sweet fruit that's perfect for when you want something sugary. But are they suitable for your dog? Are Dates Safe for Dogs? Yes! Dates are absolutely safe for dogs. They're easy to digest and contain a slew of essential nutrients that can benefit your dog's overall health. There's often a lot of confusion regarding the safety of dates. Typically, this confusion comes from the fruit's close resemblance to raisins. Raisins are not safe for dogs. This is because raisins are made from dehydrated grapes. Grapes are known to cause kidney failure in dogs. Even a small amount can be fatal. Dates, on the other hand, are not made from grapes at all. They're a completely different type of fruit. They come from date palm trees and are dehydrated for preservation. You can easily distinguish dates thanks to their distinct appearance. They're usually larger than standard raisins and take on a slightly brown hue. Another easy way to tell the difference is the pit. Dates have a hard brown seed inside that must be removed prior to eating it. These natural treats are an excellent way to reward your dog. They can be fed in moderation without having to worry about any unhealthy side effects. Generally, they're considered to be free of allergens. If you're still on the fence, here are some great benefits that you should know about. Dates are a natural source of fiber. Fiber can help to support your dog's digestive tract. It can maintain proper functionality and help avoid issues like constipation or diarrhea. Furthermore, a healthy dose of fiber is essential for maintaining blood sugar levels. It slows glucose absorption and may help to prevent diabetes and excessive weight gain. To maintain your furry friend's overall health, you need to avoid excessive amounts of fatty foods that could potentially clog their arteries. Store-bought treats are notorious for their fat content. They're filled with fat to provide a boost of energy and loads of flavor. Dates can give your dog the same positive effects of fatty treats without the unhealthy trade-offs. Dates have high levels of fructose, glucose, and sucrose. These natural sugars provide a good boost of energy that can keep your dog going during intense exercise or play. About 60% to 70% of a single date is made up of these natural sugars. When it comes to heart health, dates can keep your dog's cardiovascular system in check. It has high levels of potassium, which can manage your pup's blood pressure. 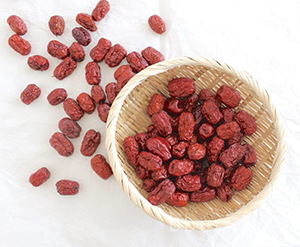 Even with their small size, dates are filled with a wide range of vitamins and minerals. They'll give your dog's immune system a boost so that they're better equipped to fight off infections and diseases. Minerals like iron and zinc can also help to promote proper bone development. Some nutrients that you'll find in dates include Vitamin A, calcium, Vitamin C, riboflavin, and so much more. Most dogs won't have a problem gobbling any dates you put in front of them. They'll be attracted to their sweet smell. Before you let your pooch snack on a date, you need to make sure that it's safe for them to eat. The first thing you'll need to do is remove the pit. The pit is a hard seed in the center. While it's not inherently dangerous like other fruit seeds, it does pose a choking hazard. Even if your dog swallows it without choking, it can become lodged in their intestinal tract and cause a blockage. It's best to get rid of the pit altogether to avoid the risks. Simply slice each date and remove the hard seed. When you're first introducing the treat to your dog, start off small. Give them a single date and see how their body reacts. While dates are considered safe for dogs, introducing a new food may cause stomach upsets. See how your dog's body reacts before you start giving them dates on a regular basis. Is It Possible to Feed a Dog Too Many Dates? Dates should only be fed in moderation. You wouldn't feed your dog an entire bag of doggy treats in a single day, so you'll want to keep that same mentality when you're rewarding them with dates. It should be used as a reward for good behavior or an occasional snack and nothing more. As mentioned earlier, dates have very high levels of sugar. Consuming too much can make them hyperactive. They can become jittery or even dehydrated. A regular diet consisting of large amounts of dates can also result in weight gain or diarrhea. Despite all of the great benefits that dates have to offer, they can only be enjoyed if your dog consumes the treat in moderation. If you're looking for a healthy treat that can please your pup, consider giving them dates. They're a healthy and safe alternative to store-bought snacks. With their many beneficial vitamins and nutrients, dates are an excellent supplement to your dog's standard diet. Also Read: What Happens if your Dog eats Chewing Gum?